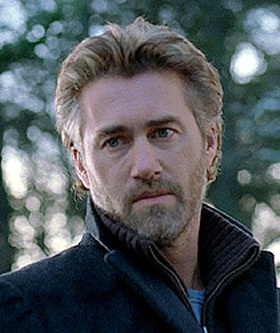 Roy Dupuis in a cropped publicity still for the film That Beautiful Somewhere. Born in Quebec’s remote Abitibi region, Roy Dupuis spent part of his youth in Kapuskasing in northern Ontario, but he didn’t learn to speak English until his family moved to Montreal where he grew up without really thinking of acting. In university he majored in science. But after seeing the film, Molière, he was bitten by the acting bug and switched from physics to theatre. His first break happened when a friend could not make an audition for the prestigious National Theater School of Canada, and Dupuis took his place. Out of thousands of applicants, he made the final cut. 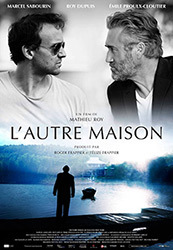 Roy Dupuis has won the Fipa d’Or of the Festival International de Programmes Audiovisuels at (Cannes) in 1991; the Métrostar Award for best actor, 1991 and 1992; the Rose d’Or for actor of the year, 1991 and picked up a Genie in 2005 for his work in Mémoires affectives / Looking for Alexander. In mid-June 2006, Dupuis began filming the dramatic feature film Shake Hands with the Devil, in which he played Lieutenant-General Roméo Dallaire, who was head of the United Nations Assistance Mission for Rwanda during the Rwandan Genocide. For his performance as Dallaire, Dupuis won his second Jutra Best Actor award. Read an article, including an interview with Roy Dupuis, about the making of Séraphin: un homme et son péché from our Take One archives.